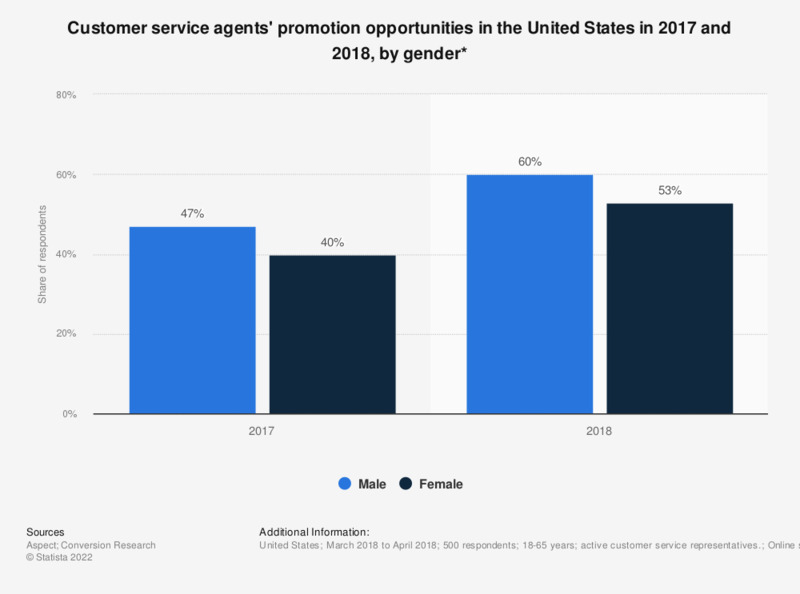 This statistic shows the share of customer service representatives in the United States by their opinion about the opportunities to be promoted and/or advance in their career at the customer service center where they were currently working in 2017 and 2018, by gender. During the 2018 survey, 53 percent of female respondents stated that they think there are opportunities for career advancement in the customer service center in which they are currently employed, an increase from 40 percent in the 2017 survey. * The question was phrased by the source as follows: "Do you feel there are opportunities for you to be promoted and/or advance in your career at the customer support center or customer service center where you are currently working?". 2018 values calculated by Statista through adding the increases from 2017 values provided in the source to the 2017 values provided in the previous report, available here. Generation X: How satisfied are you with your current career advancement? Thinking back to college, is there anything you would have done differently to be successful today? Do you have formal career development programs for contact center employees?